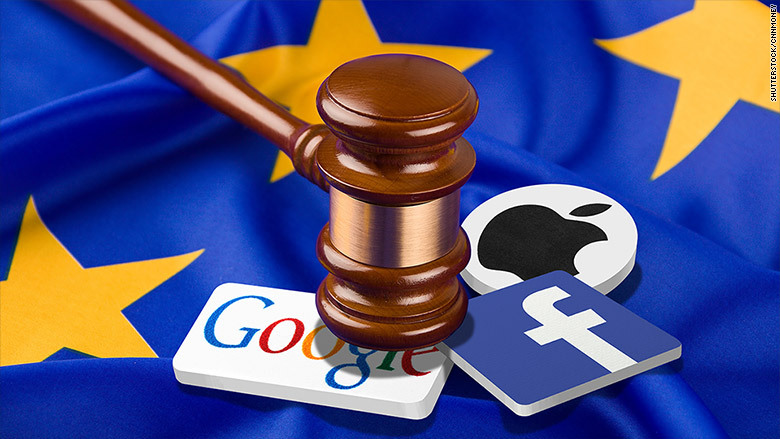 Europe is in the midst of a massive tussle with American tech giants. The European Union is getting increasingly worried about the dominance of Big Tech and has launched a program to boost the European tech sector. Apple (AAPL), Facebook (FB), Amazon (AMZN) and Google (GOOG) are all feeling the pressure, finding themselves under the scrutiny of authorities. The EU is preparing to launch an antitrust investigation into Apple's new online music streaming service, according to reports. In particular, officials are probing Apple's agreements with record labels to see if it was trying to illegally sideline its rivals. Apple did not comment on the investigation. Apple has also been accused of artificially lowering its European tax bill for decades through a deal with Ireland, where the company's European arm is based. The EU is now investigating the matter. If it decides Apple breached rules, the iPhone maker could be hit with a higher tax rate and back taxes. In a separate class action against Facebook, roughly 25,000 Europeans accused Facebook of not respecting their privacy rights and sharing their data with third parties. Facebook, which has around 300 million users in Europe, said it follows European privacy laws. Google controls about 90% of the web searches in Europe, and Brussels officials are concerned that the search engine giant is abusing its power. Specifically, Google has been accused of promoting its own services and content over its competitors' in online search results. The European Parliament recommended breaking up Google to weaken its dominance across the region. Experts say the European Commission is now preparing a new move against the company. Google has already lost its battle over the "Right to be forgotten," a European law that requires the company to remove certain unwanted, inappropriate links from search results if requested. Just last week, the European competition commissioner Margrethe Vestager launched a probe into Amazon and other e-commerce companies. The EU wants to investigate whether the online seller breached rules on cross-border trade, for example by charging dramatically different prices for the same product across different EU countries.